Habit: Shrub, small tree, 1--6 m; dioecious (monoecious). Leaf: simple, deciduous, 5--13 cm, 2--5 cm wide, elliptic to narrow-obovate, abaxially paler, sometimes puberulent becoming glabrous, adaxially glabrous; margins generally entire, +- rolled under; stipules early-deciduous; petiole 5--15 mm. Inflorescence: racemes on short lateral branches, 3--10 cm, pendent, bracted; pedicel bractlets 1--2, near top. 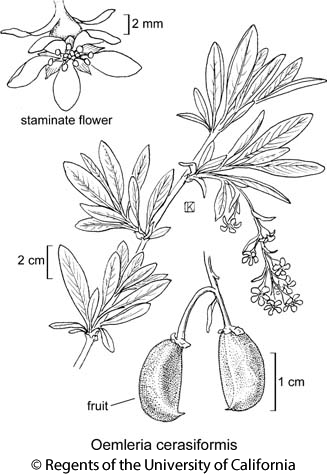 Flower: fragrant, unisexual, occasionally bisexual; hypanthium 3--4.5 mm, bractlets 0; petals 3--6 mm, clawed, white. Staminate Flower: hypanthium persistent; petals > pistillate petals; stamens 15, in 3 series, prominent. Pistillate Flower: most of hypanthium deciduous after flower; ovaries generally 5, prominent, free, styles deciduous. Fruit: drupes 1--5, 5--15 mm, bean-shaped, blue-black, glaucous. Chromosomes: x=8. Citation for this treatment: William J. Hess & Thomas J. Rosatti 2012, Oemleria cerasiformis, in Jepson Flora Project (eds.) Jepson eFlora, http://ucjeps.berkeley.edu/eflora/eflora_display.php?tid=34900, accessed on April 23, 2019. NW, w CaR, w SN, ScV (Sutter Buttes), s-c SnJV, w CW, sw WTR; Markers link to CCH specimen records. Yellow markers indicate records that may provide evidence for eFlora range revision or may have georeferencing or identification issues. Purple markers indicate specimens collected from a garden, greenhouse, or other non-wild location.